Faceted red bulbs will bring a festive holiday sparkle to your holiday trees and light displays. These LED lights, which come in bags of 25 bulbs (price is per bulb), are ideal alone or combined with other colors on your holiday tree. 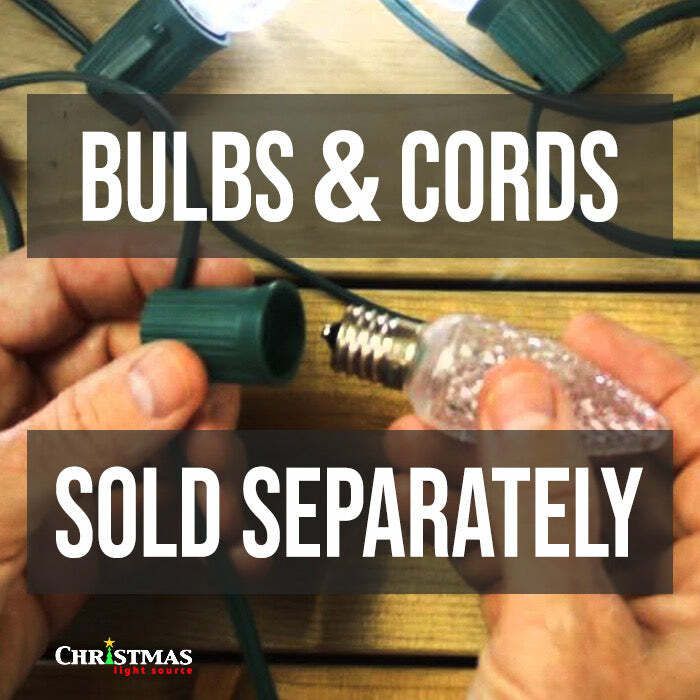 When placed in your cord, purchased separately, they bring the spirit of Christmas to your house in uses on mantles, wreaths or even your outdoor lighting. Outlining your front door, porch or sidewalk with these C9 bulbs will spread Christmas cheer to the entire neighborhood. These LED bulbs are especially economical as they can be used for decorating throughout the year for Valentine's Day, July 4th or children's birthday parties. These energy saving bulbs are a "must-have" when considering your holiday lighting purchases. These type of bulb is not your normal run of the mill Christmas light bulb. They are the the cream of the crop! Super bright using 5 diode LEDs built inside using only .58 watts which equate that 100 bulbs will use only 58 watts of energy, now that is putting money back into your pocket when those lights are turned on over a long periods of time. Yes you may pay a little more for this bulb but you get that few extra cents back in first season of use. No more glass bulbs breaking and having to be careful, love this factor, high quality here. True color displayed are perfect. Christmas Light Source thanks for putting out a great product! These are very high quality LED lights! The faceted plastic that cover the 5 internal LEDs is durable and strong. This color is bright and beautiful. I have these lights paired with Pure White and Green LEDs and they look very nice! I wish they were less expensive. However, I considered this Christmas light project an investment in beauty that I have no doubt will give many years of reliable service. The neighbors all want to know where I bought my amazing Christmas lights. This was my first time ordering replacement/retrofit C9 LED bulbs. These ones are bright. Each bulb has 5 LEDs inside, as opposed to the cheap eBay ones, or the really crummy molded units you find at the big box stores. These run cool to the touch (as all LED lights do), but the biggest benefit in my view is they appear about as bright as the old-school glass bulbs. I also like that these won't break in storage the way the old glass bulbs typically do. Q: Soes this bulb have 5LED's in it? These lights do have 5 LEDs per base. Q: will this bulb work in older incandescent strings? Yes, these bulbs have E17 or intermediate bases and will work in your C9 stringer cord. As long as your cords are standard and in good shape, they should work fine. Keep in mind that even though you are switching to lower amperage bulbs, you can't run more than 250 feet of your cord in a single run.